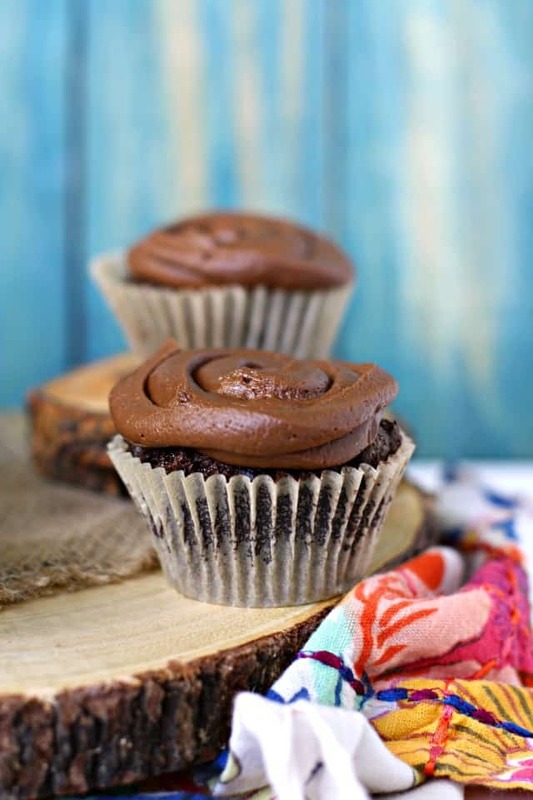 Home » Desserts » Vegan Gluten Free Double Chocolate Cupcakes. 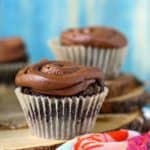 These vegan gluten free double chocolate cupcakes are rich and decadent, and are allergy friendly! The only cupcake recipe you need for parties and special occasions. When there’s a birthday party in this house, we often turn to cupcakes. And more often than not, the request is made for these gluten free vegan double chocolate cupcakes. My boys love chocolate treats, and this recipe is just the thing for a celebration. These double chocolate cupcakes are tender, rich, and so chocolatey. The best thing about this recipe is that they are so super tasty, and they’re free of the top allergens! So everyone can enjoy these. This is a great cupcake recipe to make to have on hand for when your child is invited to a birthday party. You individually wrap these and store them in the freezer so that you can just grab one when you need one. Be sure to let it thaw for a few hours before the party. How do you make vegan gluten free chocolate cupcakes? The ingredients for this recipe are fairly simple – cocoa powder, sugar, non-dairy milk, coconut oil, and gluten free flour blend. You can mix the batter using an electric mixer or by hand – it’s up to you. Bake at 350 degrees for about 20 minutes. Be sure to let the cupcakes cool completely before frosting them. If you don’t want to frost these, you don’t have to! They are delicious even without icing. You could just dust them with a little powdered sugar if you want. 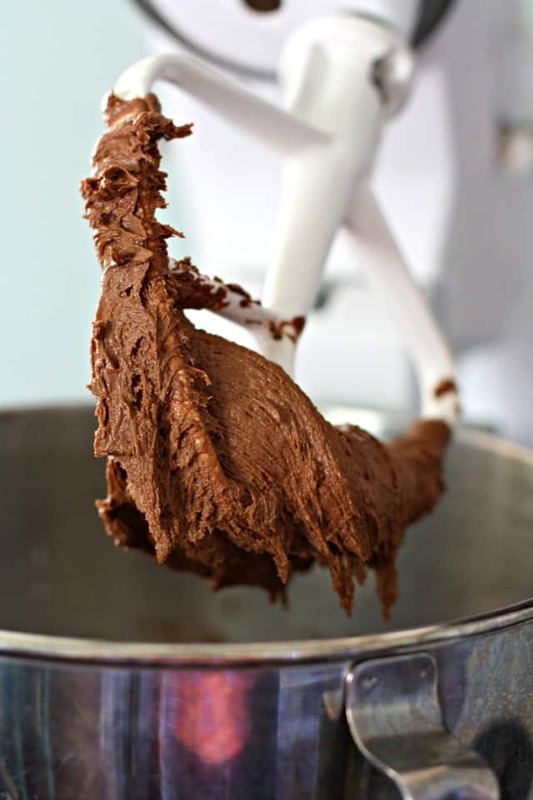 Can you make decadent vegan chocolate frosting without milk or butter? Yes, you certainly can! No one will guess that this chocolate frosting is dairy free and vegan. It’s smooth, creamy, and pipes very well. 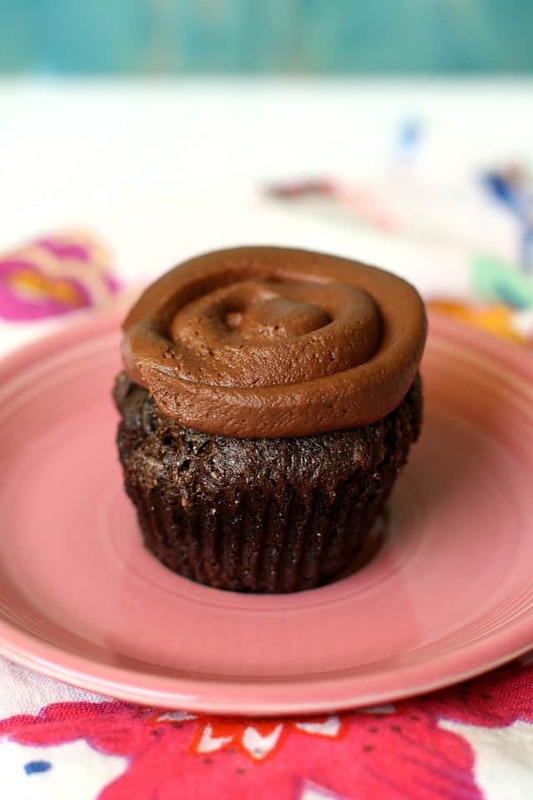 What type of gluten free flour is best for gluten free chocolate cupcakes? This recipe should work well with most all-purpose gluten free flour blends. I have made these cupcakes with my own gluten free flour mix, with Now Foods Gluten Free Flour Blend, and with Namaste Perfect Flour Blend. All of these flours work well. Some gluten free flour blends soak up more liquid than others, so if you find that your batter seems too thick, go ahead and add more non-dairy milk. I don’t think this recipe will work with coconut flour – the cupcakes will be flat and dense if you use only coconut flour. Can you use oat flour to make gluten free cupcakes? You can try oat flour in this recipe. It should work, however, the cupcakes may be a little more delicate and possibly slightly crumbly. 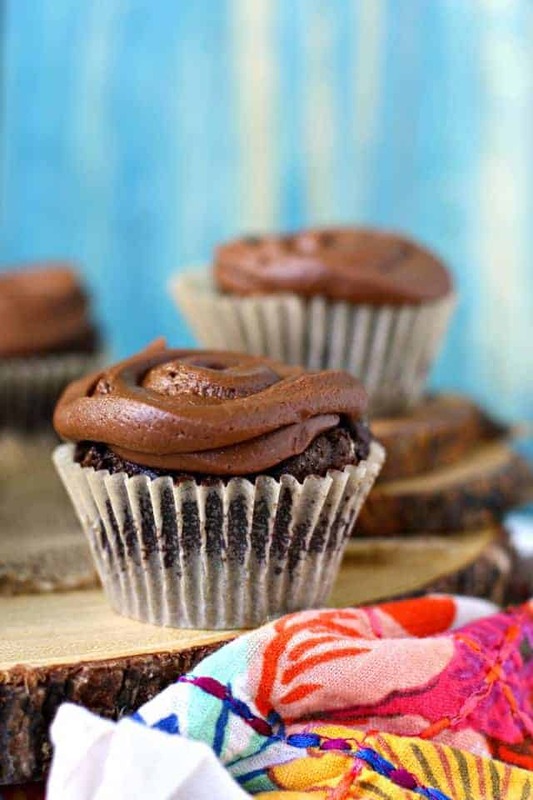 The coconut milk and the coconut milk yogurt keep these vegan gluten free double chocolate cupcakes very moist, and also give them a very light coconut flavor. The frosting makes a generous amount, and if you have any left over, it is delicious on graham crackers or strawberries. If you make these cupcakes, or any of my other recipes, please share on Instagram, and tag me @prettybeeblog. I love to see what you’re making and baking! Vegan and Gluten Free Double Chocolate Cupcakes. 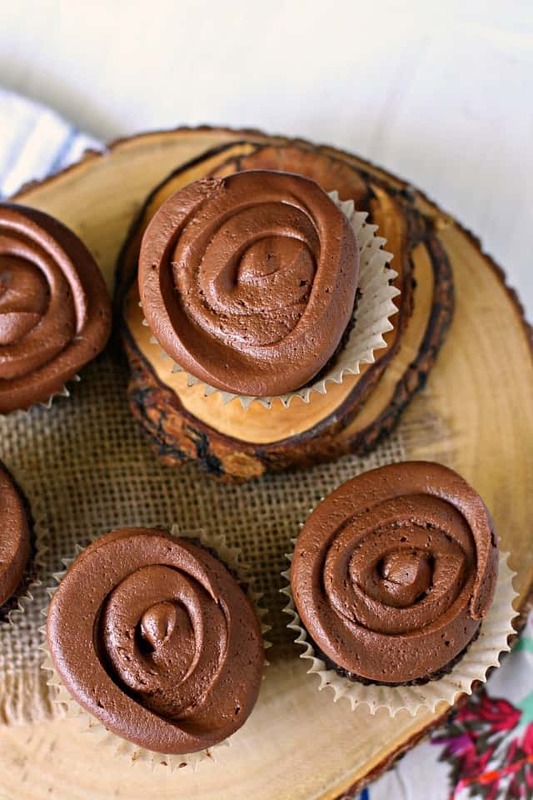 Rich, moist, and delicious vegan gluten free double chocolate cupcakes. Perfect for a party, these cupcakes are free of the top 8 allergens. Preheat the oven to 350 degrees. Line a cupcake pan with paper cupcake liners. Measure 1/3 cup of coconut oil and put it in a small bowl. Microwave for about 15-20 seconds until it is melted. Set aside. In a large bowl, whisk together the gluten free flour blend, cocoa powder, sugar, baking soda, and salt. Add the coconut oil, non-dairy milk, vanilla coconut yogurt, vanilla extract, and vinegar, and mix until smooth and combined. (You can use a mixer, or just do it by hand. Either way works). If the batter seems too thick or dry, add more liquid. Some gluten free flours really soak up the liquid, so adjust the amount if needed. Bake at 350 degrees for 19-24 minutes, or until a toothpick inserted inside comes out clean. Place the cupcakes on a wire rack to cool. Repeat with remaining batter (you will have enough for 2 or 3 more cupcakes). Cream the vegan buttery spread in a large bowl. Add a little bit of the sifted powdered sugar and cocoa powder. (To make things easier, I sift these together). Continue to mix on low speed. Alternate adding the sugar and cocoa powder and drizzling the non-dairy milk in until the desired consistency is reached. The frosting should be thick but spreadable. Frost the cooled cupcakes, and store in the refrigerator if you are not going to serve them right away. You can freeze these cupcakes if you would like to - be sure to wrap them individually, and let it thaw for a few hours before you need to eat it. If you aren't gluten free, you can make these with regular all-purpose flour. If you aren't vegan, you can use regular butter and dairy milk. Store leftover cupcakes in the refrigerator or freezer. This post was originally published in February 2015. It has been updated with new photos and text. Want more dairy free, gluten free, and allergy friendly recipes? 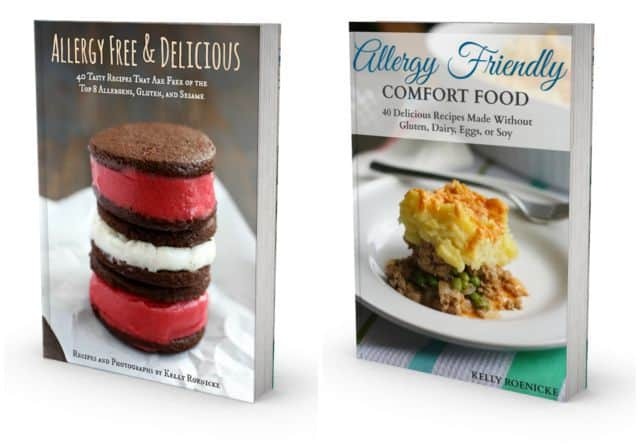 My eBooks, Allergy Free & Delicious, and Allergy Friendly Comfort Food are full of colorful, tasty, easy to make recipes that are allergy friendly. « Simple Hot Fudge Sauce (Dairy Free). Has anyone tried using this matter to make a 9×13 inch cake? If so, how long to bake? My other GF vegan cake recipe tastes awesome but is so incredibly crumbly that it is a mess to eat. Super awesome, everybody love them. Perfect for birthday party with friends! Made these just as written, using Bob’s 1 to 1 Gluten Free Flour. Not a bit gritty or gummy; thank you for a perfect recipe! Can the Cane sugar be replaces by Agave or Honey by chance? I don’t know what that would do to the texture. But you could do coconut sugar or maple sugar. What kind of cocoa powder should be used? Dutch processed or something else? I use Hershey’s unsweetened cocoa powder because I am comfortable with their allergy policy. I am in the middle of making a double recipe for my daughter’s birthday, and the batter is so thick! I am nervous. Did I do something wrong? It is a thicker batter. Did it turn out okay? You can use applesauce! Will that work? How about prune or beet puree? You can even use baby food versions. White vinegar or apple cider vinegar will work well! For a vegan and gluten free recipe – these cupcakes still look so rich, decadent, chocolat-y and delicious. Love it! These cupcakes look absolutely fantastic! It looks decadent, but I love that you lightened up the cupcake with yogurt! Wowza – those are some gorgeous cupcakes – you can’t go wrong with chocolate & coconut.